It's funny – On Earmilk we showcase so much dance & hiphop and an overall hearty dose of DIY sort of basement producers and the like, some would say we revel in it. Maybe we find it the most fascinating (right now) or maybe it's simply more readily available for critique (verses, for instance, Pink Floyd which no doubt would get cerebral). Regardless, I often find that after spending a lot of time working on Earmilk and toiling away with playlists & producers, I miss my roots, our roots. You know – Rock (all flavours), and those groups of guys & gals that go on stage and play instruments – a band. Often each member plays one instrument to fill out the spectrum, etc etc. Native Instruments apparently remembers. …both experienced and hobbyist musicians and producers to create authentic acoustic drum tracks, combining meticulously-sampled drums, recorded at Abbey Road Studios, London, with a comprehensive Groove Library and a detailed Mixer Section with class-A studio effects. 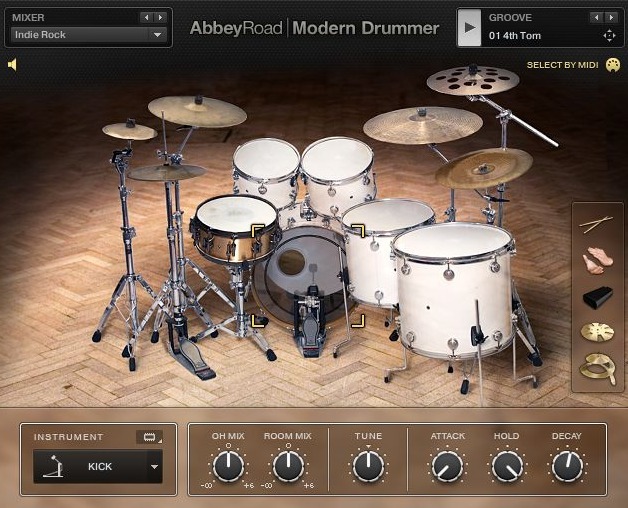 This 'Drums, Studio, Drummer' approach was pioneered recently in Native Instruments' STUDIO DRUMMER, and the new ABBEY ROAD DRUMMER instruments use the same technical framework, based on KONTAKT 5. The instruments run in the latest version of KONTAKT 5 or the free KONTAKT 5 PLAYER. Owners of existing ABBEY ROAD DRUMS products are entitled to a free upgrade to the new version of the instruments they own. Either way, it truly is amazing how far music production has come, how available even the most pro sounding gear is these days.